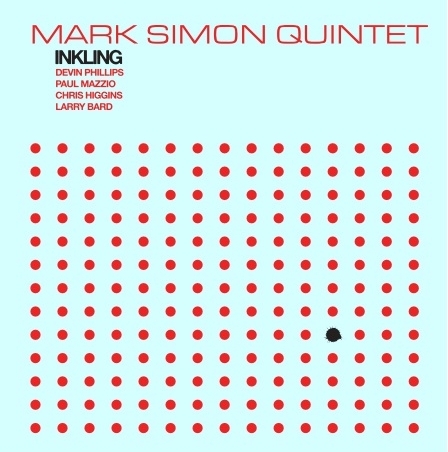 PJCE Records announces the release of “Inkling,” a collection of hard-swinging original compositions with a quintet of Portland all-star jazz players from veteran pianist Mark Simon. “In life, as well as on the bandstand, sometimes you have no idea what is going to happen next. However, if you have an inkling of an idea, 99 out of 100 times, that is exactly what will happen.” This is Mark Simon’s explanation of the title of his third album as a leader, but its also a guiding principle of his work as a creative artist. His compositions and playing capture the spontaneous feeling and the confident attitude of his philosophy, as well as a heavy dose of old school swing. With Inkling, Mark Simon assembles a group of Portland veterans, all of them long-time collaborators who were hand picked to present this music: Paul Mazzio, Devin Phillips, Chris Higgins, and Larry Bard, drums. And Simon himself, who held the regular piano chair in bass legend Leroy Vinnegar’s quartet, has this same veteran status. Each of these experienced players brings a special blend of talent and personality to the music, and Simon capitalizes on this with his deft compositions. Like Ellington, “Mark writes with the individual musicians in mind. He finds their strengths as players, but sometimes even writes for their weakness to spur them on to greater heights,” said tenor saxophonist Devin Phillips. This record is an important addition to the PJCE Records catalogue. As founding Director Dan Duval steps down to pursue his Shadow Government Academy guitar program, incoming Director Lee Elderton saw this record as an opportunity to include more musicians playing straight-ahead jazz. But, in honor of our mission to promote original music, all of the compositions on the record are Mark Simon’s. And each of them has a story. “Blew Brush Sermons” is an anagram for “Mel Brown’s brushes,” a nod to one of Simon’s long-time musical partners and a living Portland musical institution. Drummer Larry Bard’s solo takes Simon’s melody and translates it to the drums, a technique inspired by Brown’s playing. This is an inspired and eclectic jazz recording that will appeal to fans of swinging, joyful, and energetic jazz that honors the tradition while still covering new ground. And most importantly, its played by a band that has a history. Paul Mazzio appears on Simon’s first album Portland Nights, and Simon and drummer Bard grew up together in Chicago, and have worked together ever since. Inkling is not simply a blowing session, but the culmination of years of companionship and dedication. Mark Simon couples jazz experience with a myriad of jazz influences to create a style of playing and writing that offers a mature outlook while pushing his work out to the edge of contemporary jazz. Simon, a Chicago-born Cub fan, has been playing jazz for over 30 years. He started by playing along with old Jazz At The Philharmonic records from his father’s massive and eclectic record collection, which ran the gamut from early jazz master Louis Armstrong to avant-garde Cecil Taylor. By 13, Mark was listening to Lester Young, Charlie Parker, Roy Eldridge and other jazz legends while his school chums were gearing up to Led Zeppelin. From “sitting in” with his father’s records, he enrolled in a youth summer jazz camp at the University of Illinois, where he was exposed to the live side of jazz. Mark would sneak out of the dorm at night to sit in with the faculty on jam sessions, providing him with a sense of excitement in playing that he’s never lost. “The faculty would have these all-night jams and I was the only student invited to sit in. It was an awesome and valuable experience and it gave me a real foundation in jazz”. Mark has been a Portland resident since 1978, when he came west from Chicago to study jazz at Mount Hood Community College. He’s been a featured performer with the MHCC alumni band at several Mt. Hood Festival of Jazz events. Since then, he’s played with most of the jazz stalwarts in the Portland area, including Mel Brown, Glen Moore, Nancy King and Ron Steen.